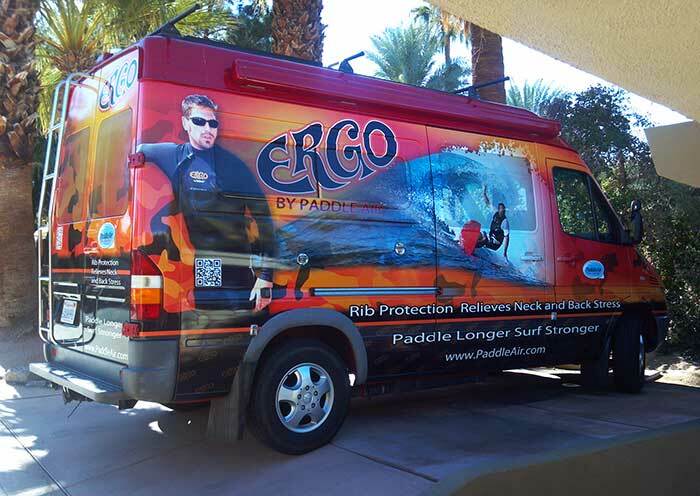 Southern California-based PaddleAir Inc., originators of the proven PaddleAir paddling aid for surfing, will be taking to the beaches starting in May for a hands-on demo tour featuring its latest product: Ergo. 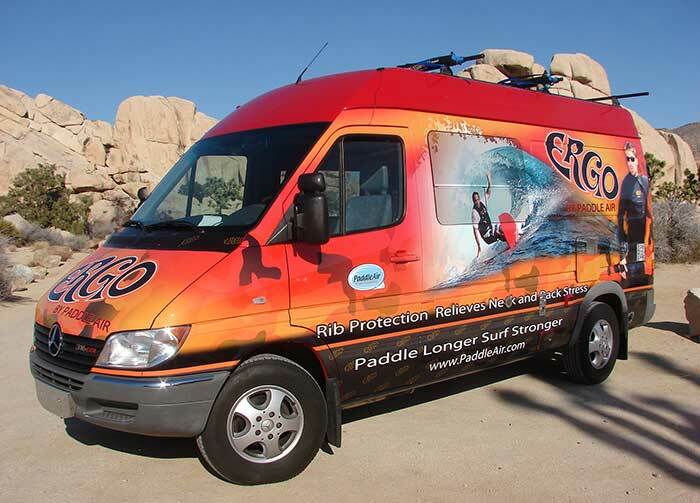 “We want people to see our products and more importantly try our products to experience how much they help improve paddling and relieve the stress in your neck and lower back,” says Dave Hilts, founder and president of PaddleAir, Inc.
Hilts will be at the wheel of the company’s colorful new demo van visiting beaches throughout Southern and Northern California and Oregon through the summer. He plans on giving in-depth product demonstrations for his expanding dealer network and allowing people to try the product in action at selected beaches. The orange and black demo van is easily recognizable with PaddleAir Ergo logos and a great photo of Australia’s David “Spud” Keevers on the side-panels. Spud is seen cranking a cutback and wearing a PaddleAir Ergo Vest while riding an awesome wave somewhere in the Mentawais. Keevers found that the PaddleAir product did indeed relieve his lower back pain. He liked it so much he ordered some for his shop and is now one of PaddleAir’s top dealers in Australia. Keevers, in true Aussie form, took one of his Ergos and cut the sleeves off for a better fit in the tropics. When he sent the picture that is now on the side of the demo van, Hilts noticed the customized shirt. Hilts has been refining the bladder and inflation delivery system over the years, and the latest version of Ergo now features an ultra form-fitting bladder and almost invisible hose for inflation. The informal demo sessions will provide the opportunity for Hilts to interact one-on-one with fellow surfers looking to improve their paddling efficiency and relieve the stress of everyday paddling from their necks and lower backs. PaddleAir products have also helped a multitude of surfers with severe chest and rib-cage pain get back in the water. For more information on PaddleAir products and product demonstrations visit PaddleAir.com. Hilts will also be posting his itinerary for beach demonstrations on Facebook.com/PaddleAir, Twitter, and Google+. PaddleAir Inc. is the originator of the first power paddle-wear garment for surfers. Founded in 2004, by David Hilts, PaddleAir is committed to creating products that make paddling a surfboard easier, safer, and more comfortable for those passionate about surfing. The company’s mission is to develop new and innovative products of the highest quality possible, and give back to the surfing community tools that will enhance the surfing experience for the generations to come. PaddleAir products are available world-wide at selected surf shops and online at PaddleAir.com. Paddle stronger and surf longer with PaddleAir!